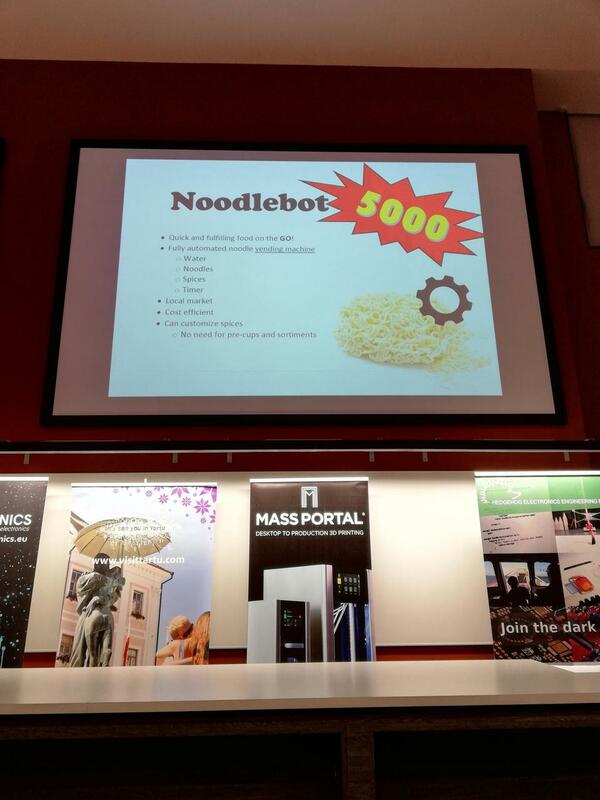 Join the celebration of 5 years of Garage48 Hardware & Arts hackathons via Live Blog Feed! 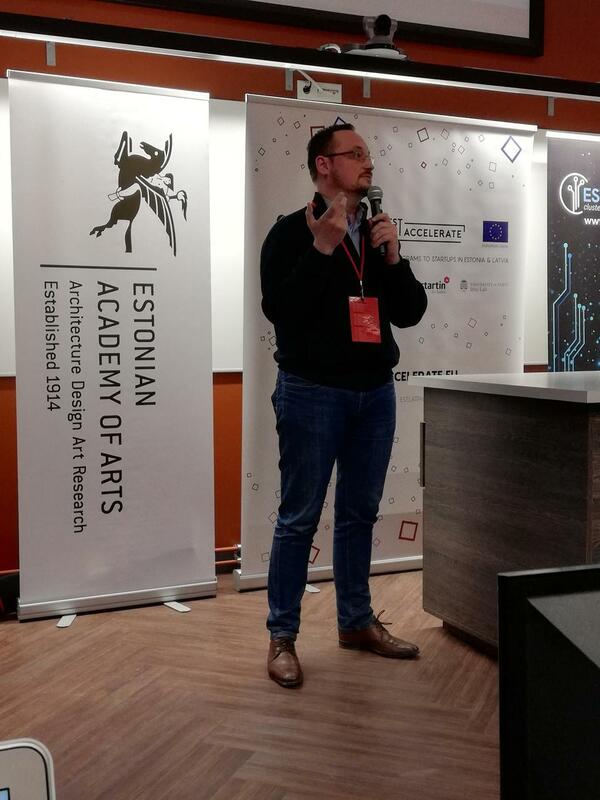 The Garage48 Hardware & Arts 2018 is taking place at the University of Tartu Physicum and will be gathering participants across the Baltics. 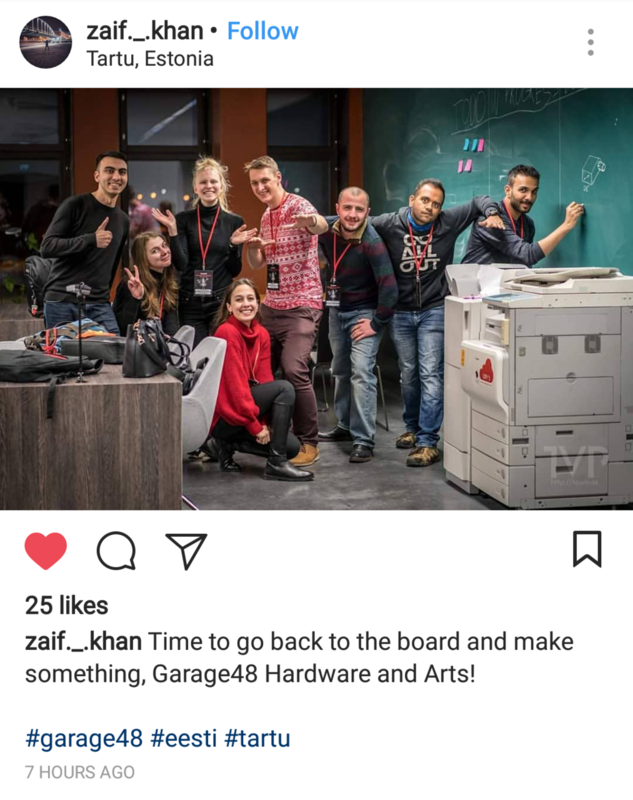 All hardware & creative industries enthusiasts, startups, Garage48 fans and our friends/families following the event from home can expect exclusive photos on the scene and behind the scenes, spicy comments from the participants during the event and social media likes and love. Favourite of the Audience - Boardmix. To see their projects behind the names check out this post HERE! 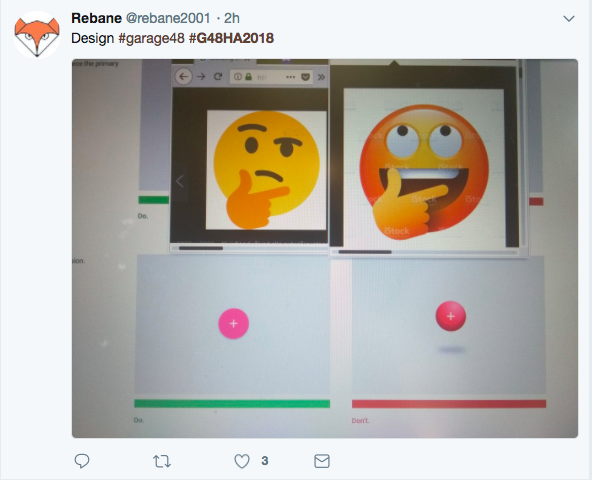 Congratulations to USB on winning the Garage48 Hardware & Arts 2018! Congratulations to Boardmix on the Favourite of the Audience award! With impressive 340 reactions and 16 shares you deserve it! The last team is finishing their pitch! The judges have a lot of work to do, before they can present their final decision. If you are introducing a food related item, you can expect a tasting test! The finale has started and the first team Trickcolour has taken the stage! Time to start cleaning up! The finale is just 1.5 hour away. 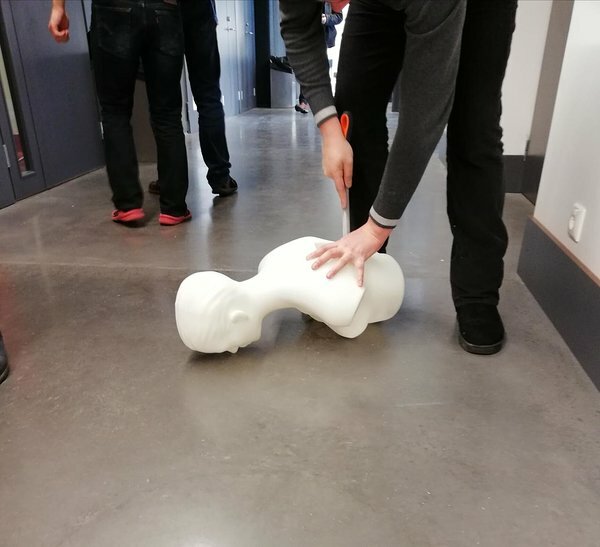 Time to put those finishing touches to your prototype and make sure, that the rooms you worked in are nice and clean! Find us from the media! The ERR will live stream the finale at their Novaator site. Check it out HERE! The Garage48 Hardware & Arts final starts at 5pm! 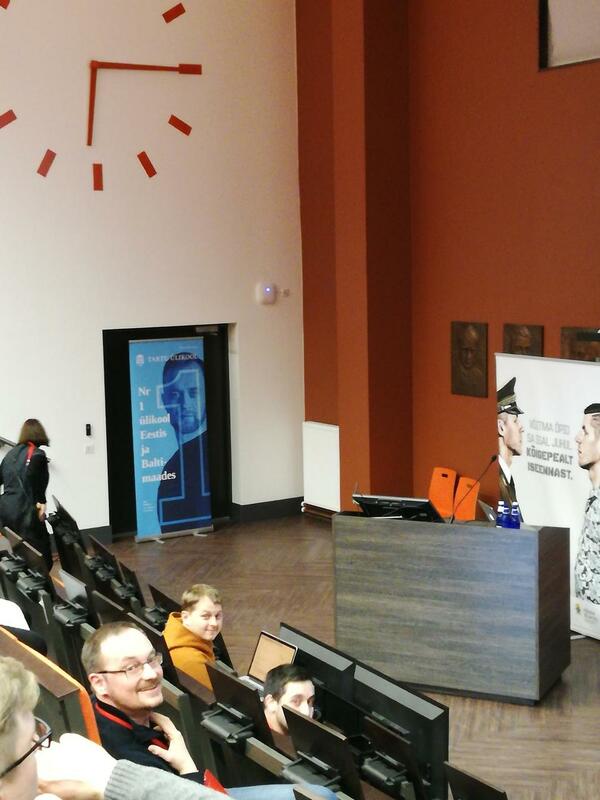 Come join us at University of Tartu Physicum or check out the live stream HERE! Pitching drill session #2 is starting! Make sure that you have your pitch ready, the prototype with you and everything surrounding a pitch figured out! The important thing is to come prepared, this is the main rehearsal! The time is running up, but there is still some work to do. More pictures are up now! Have a look HERE! Pitch drill session #1 has started. This is the session where you will get feedback and constructive criticism about your script. Keep an open mind and write down the comments from the mentors to make sure, that you have the best pitch possible! 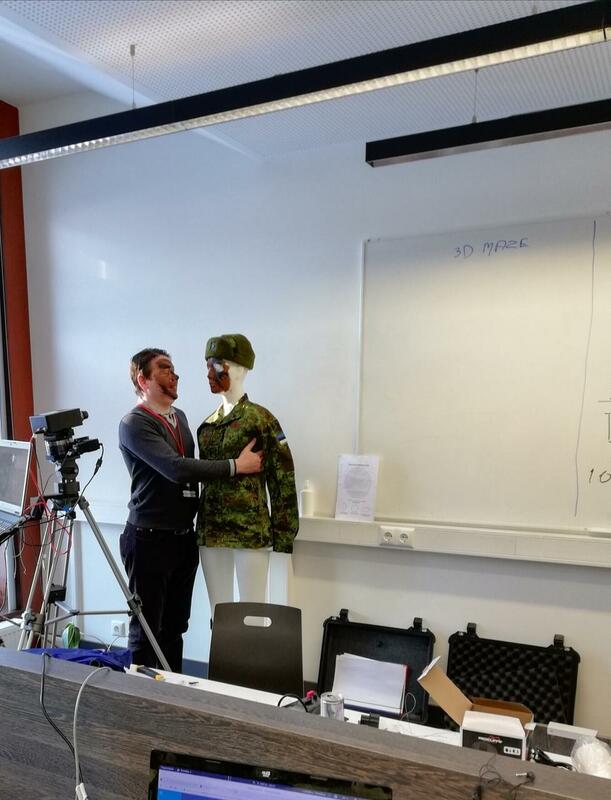 One is man and the other one is dummy, but can you tell which is which? The night was long and so were the printing sessions. 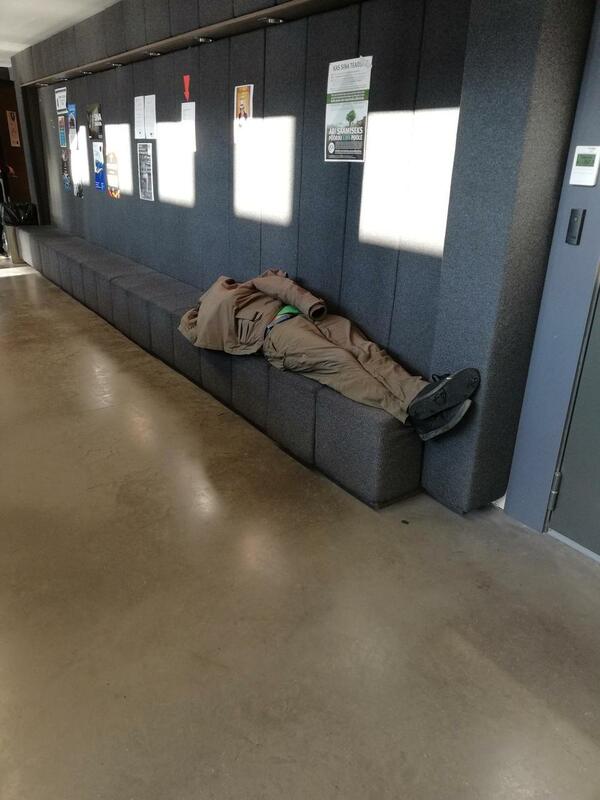 Time to catch some shuteye wherever you can get it. Time for checkpoint #3, this is the last checkpoint before the pitch drilling starts! What's cooking in Physicum? 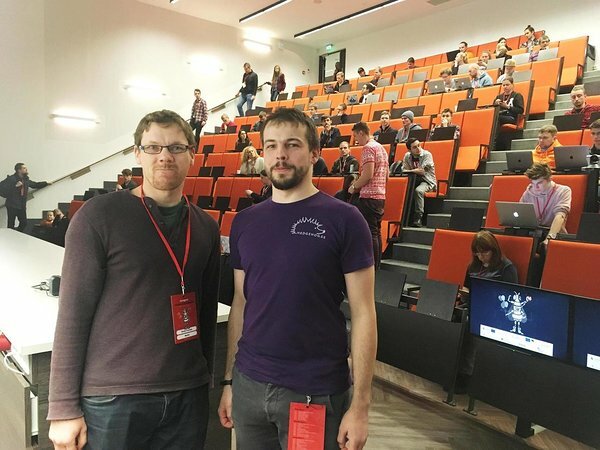 Read the blog post about all the projects HERE! 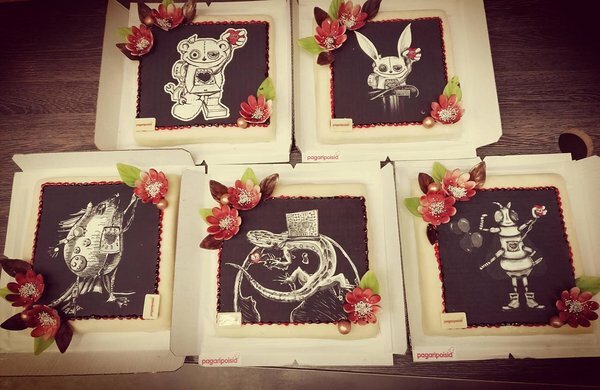 Happy birthday to Garage48 Hardware & Arts who is now 5 years old! There have been many wonderful people and ideas during these past 5 years. Sincere thank you to all the people who have made Garage48 Hardware & Arts the amazing hacakathon it is today! The checkpoint #2 is finished! 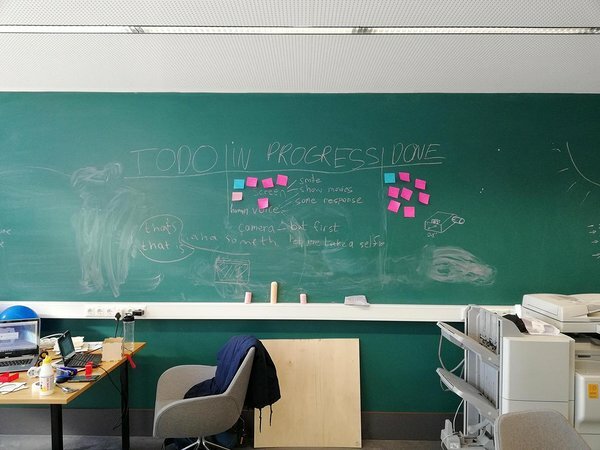 The teams are working, the prototypes are slowly coming together and there were no panic moments. 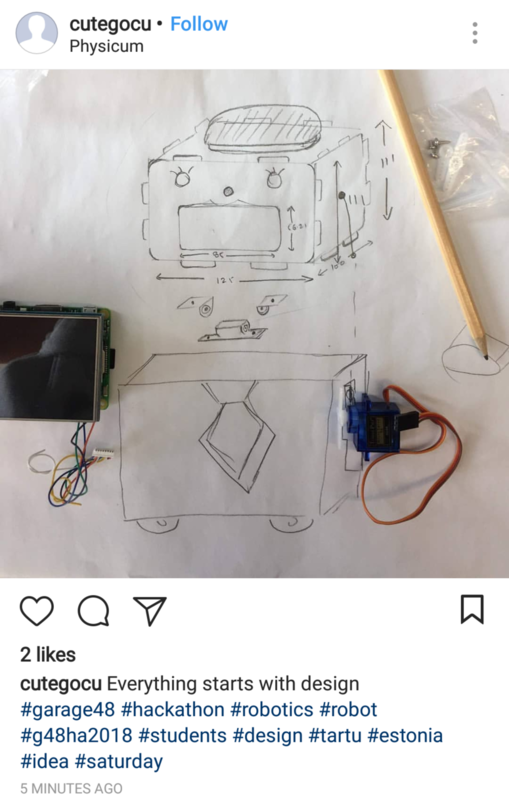 Seems like everyone has their thing in order and will be ready to present their prototypes tomorrow. When the face of Priit Salumaa keeps staring at the pitchers, then there is only one option. Move it from the back to the side, so Priit can look over everyone even better. The pitching drill introduction is now over and checkpoint #2 is about to begin! The Game is on! Time to pick your favourite team! Giving a vote to your favourite team is easy, just go over the teams HERE and like, love and share your favourite team! The pitch drill introduction is now starting! 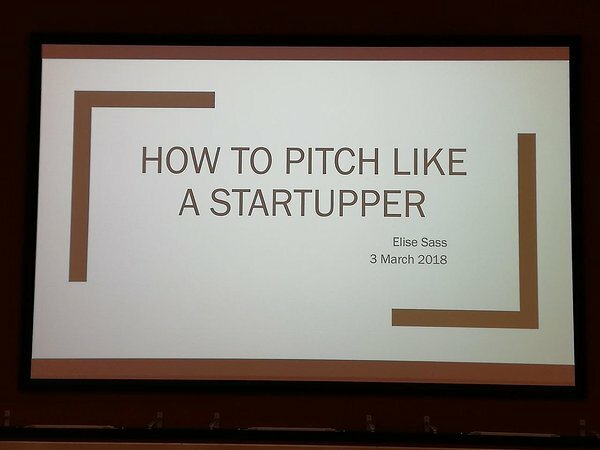 Time to learn how to pitch like a startupper! In 30 minutes the pitch drill introduction will begin. Here you will learn what to do and what not to do during you pitch tomorrow. Be prepared, only one hour until checkpoint #2! 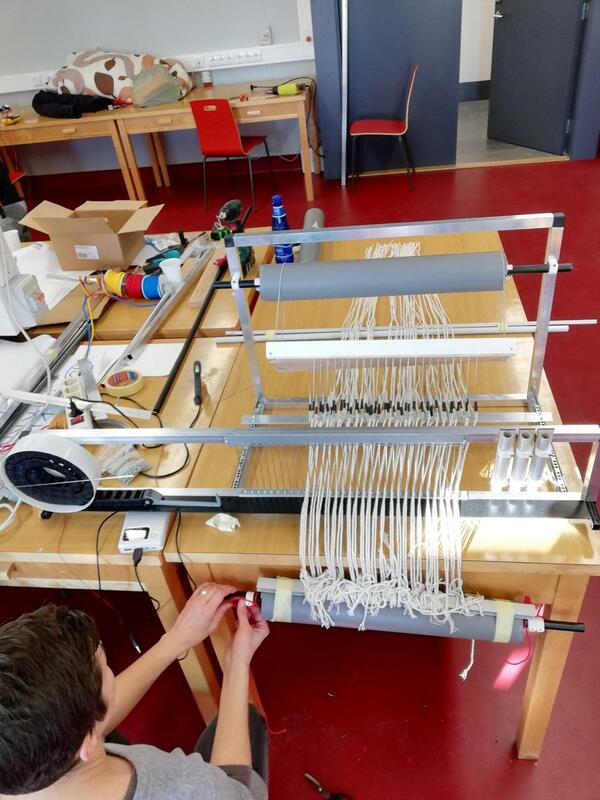 Things are slowly starting to take shape, but much work is still needed to present the prototypes tomorrow! Life tip for all the hungry students out there! 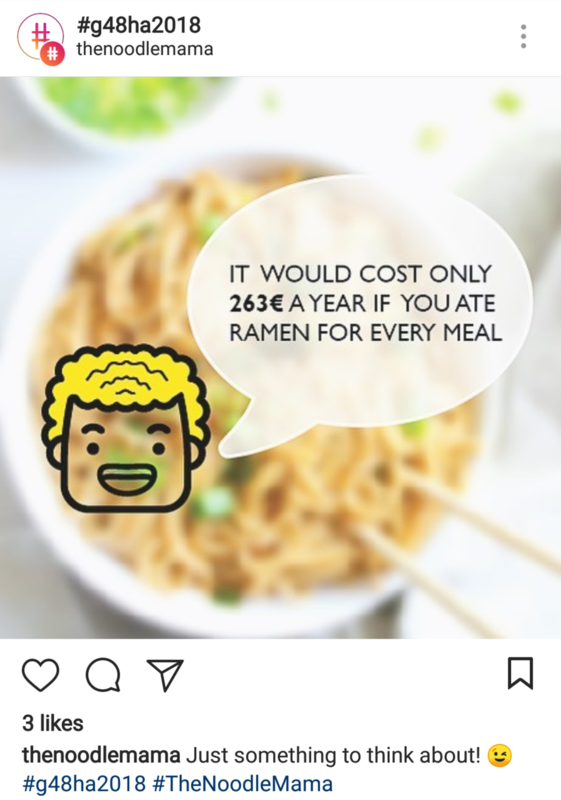 Only eating ramen for a year will cost you only 263€. 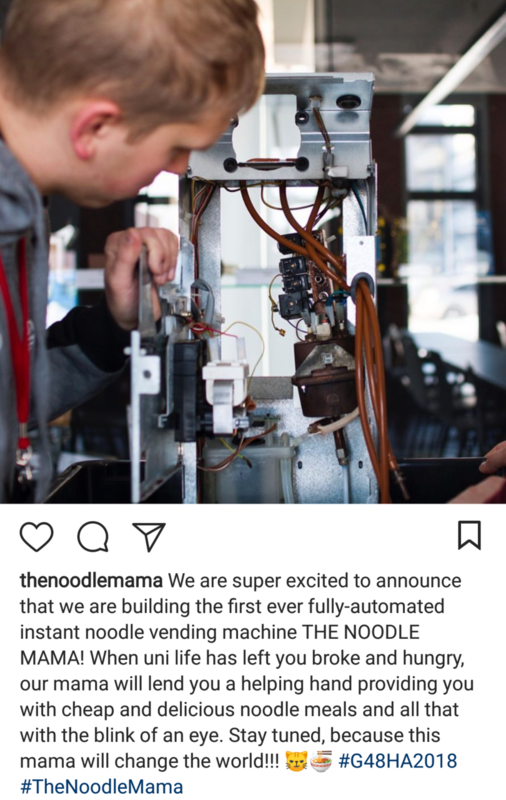 Maybe becoming ramen profitable is not that difficult after all! Checkpoint #2 is 3 hours away! Make sure, that you know, what you still need, in order to finish your projects by tomorrow morning. 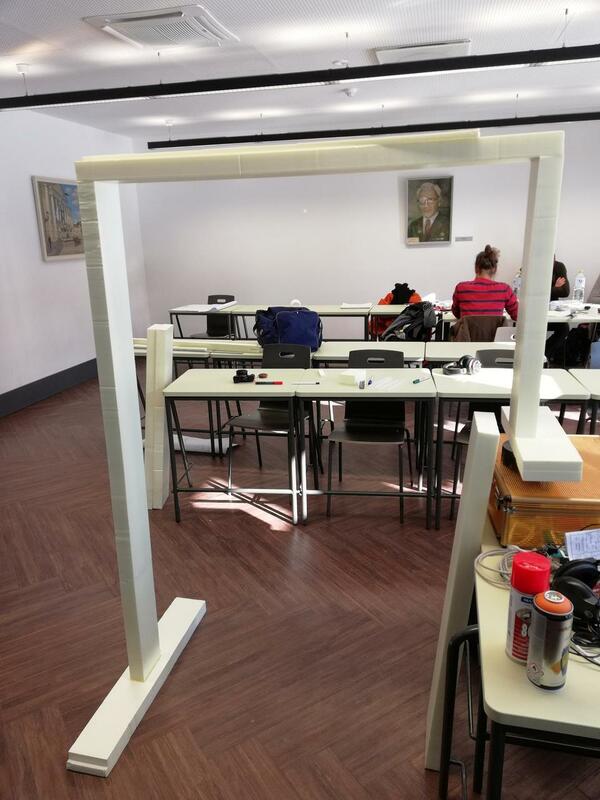 The innovation and problem solving spirit at Garage48 goes beyond the actual prototypes. 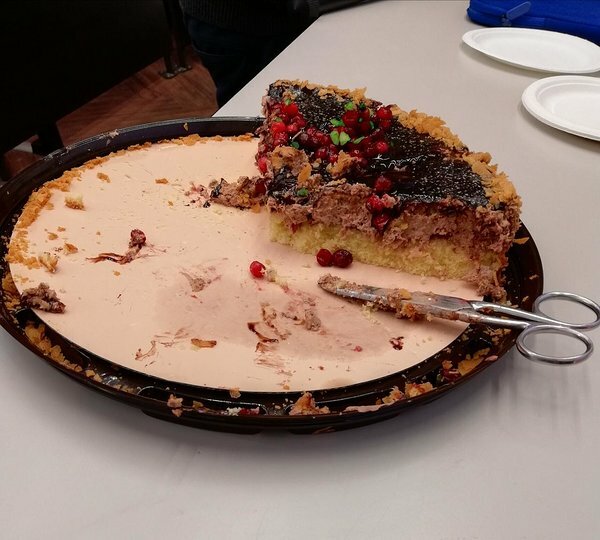 Want to eat some cake, but don't have a knife? Why not scissors! 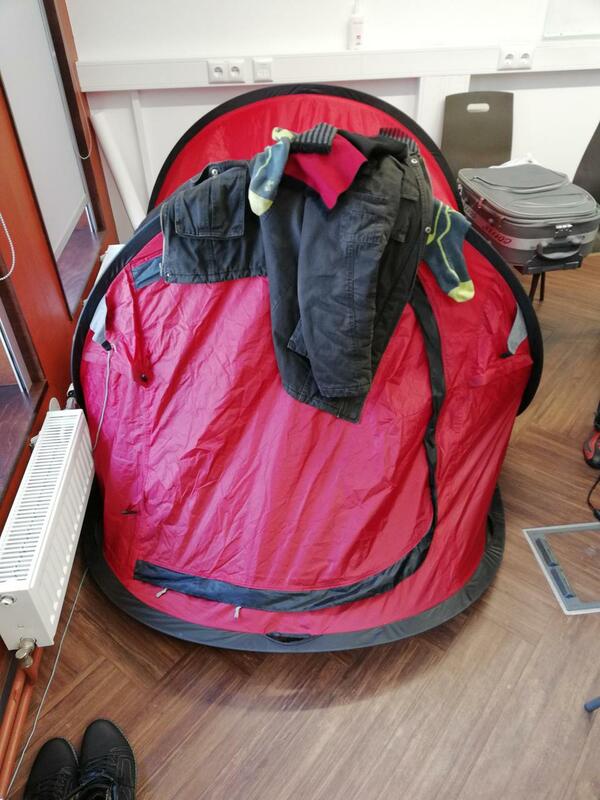 If walking upstairs to the 4th floor takes too much time and effort, you can also put up a tent next to your station to maximise both the work and sleep time you get! There is something going on here, we don't know what, but definitely something. 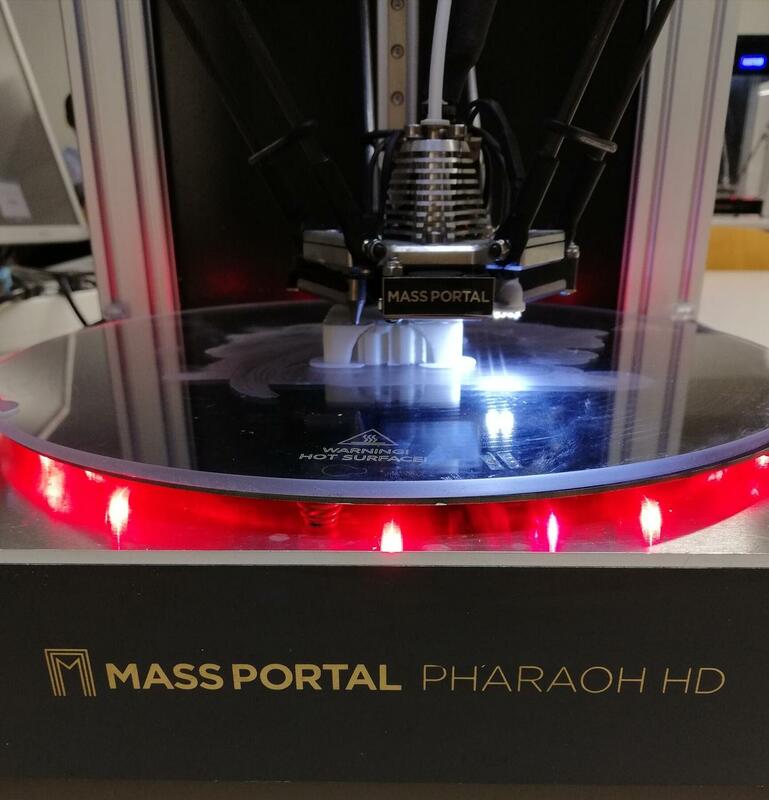 The 3D printers are up and running! Make sure you get your things to the printer as soon as possible to have everything ready by tomorrow! 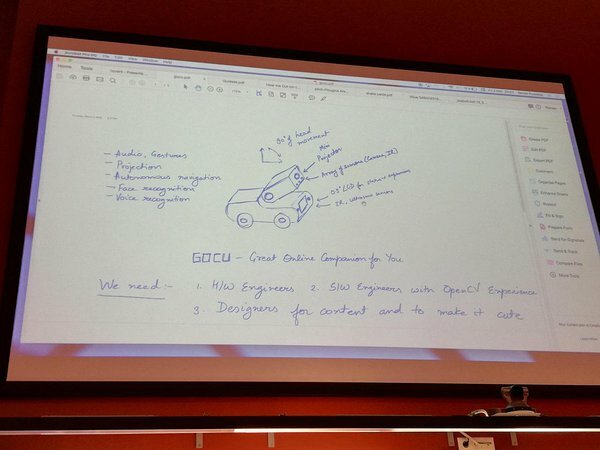 During Garage48 Hardware & Arts, noting is safe. 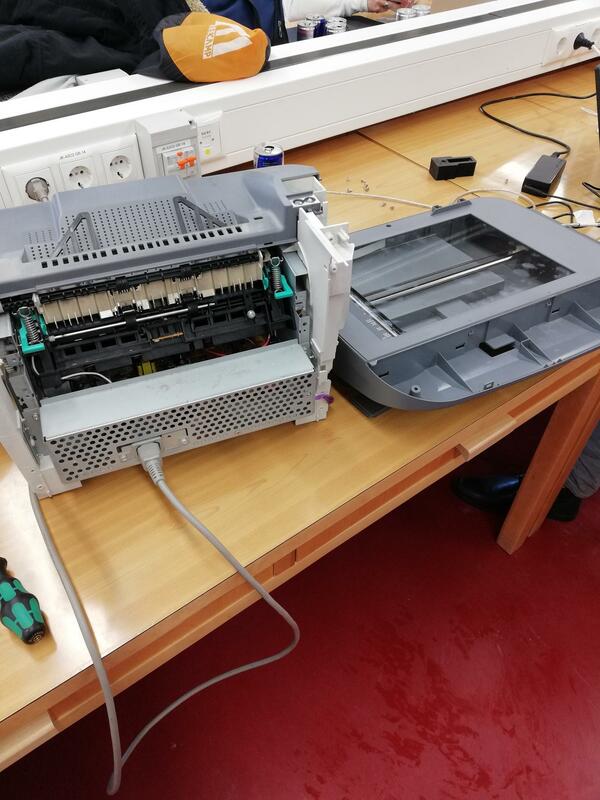 The Real-life mail spam filter team has started to dismantle a scanner to get the parts that they need for their project. The first Facebook and instagram page has been launched! No company is a real company without a Facebook page right? Lunch will begin in 20 minutes! Just to remind you that try not to burn down the building during lunch, we quite like it here. The teams are working hard on their prototypes. Still wondering if this is an actual part of the prototype or just anger management. Checkpoint #1 has ended! The mentors are on their way so prepare your questions! So what are the teams doing during the night? Taking team pictures of course! Want to know who are all these amazing teams that will be presenting their ideas on Sunday? Have a look HERE! What if the mentors don't understand what the teams are doing? No problem, the teams are not that sure about what they are doing either! The photos from last night are up! Have a look HERE! Checkpoint #1: Progress, problems and the plan. These are the things we need to hear from you. Make it interesting as the mentors are listening and picking the teams that they will be mentoring. Time to meet the mentors! There are two types of mentors: the A-team and the regular mentors. The difference? The A-team mentors will be here for two days so make sure you take use of all of their expertise. Good morning everybody! Hopefully you all had breakfast and some sleep! The checkpoint #1 is at 10, so get ready to present your idea! The 17 teams have been formed and they are ready to work! Time to agree on roles, make a schedule and start working! Checkpoint #1 is tomorrow morning at 10 am! TIP: In your schedules leave in some time to eat and sleep. The teams are being formed and after that they will need approval to start working. Just a few more moments until the real work can begin! We have finished with the pitches! All together we had 32 pitches today! Now comes the next fun part, choosing your team. Make the right decision, as you will spend the next 48h hours in a small closed off space with them. Good luck! Every person that has pitched today is now thinking how many times they said uhm... during their pitch. The anti-uhm program seems like a good idea now. Sometimes you just have too many good ideas and just have to pitch more than one! 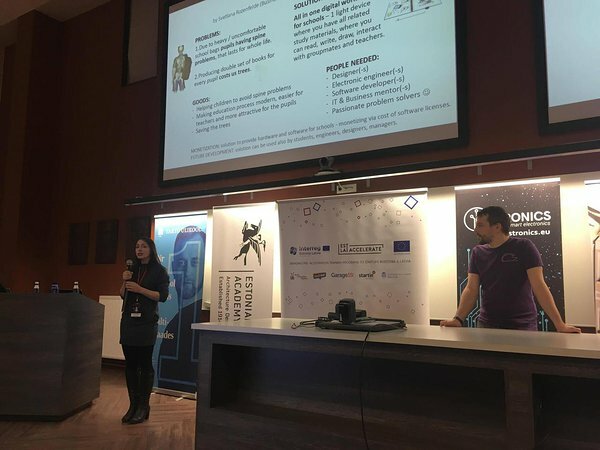 We will continue with the pitches! The first one on the stage is 1 > 4, the swiss army knife for geometry. The first half of the pitches are done! We have had some very interesting ideas already and will hear some more after the 20 minute coffee break! Reminding everybody, that it is VERY important that we have a team for the Dog Training Mat! We all want to see some dogs during this long weekend! We have heard some cool pitches already! Bored? How about rocket?- the fully automated rock-paper-scissors. Want to become a pro in chess?- Then the Malelaud is for you! The first pitch is up! Only about 39 more to go! 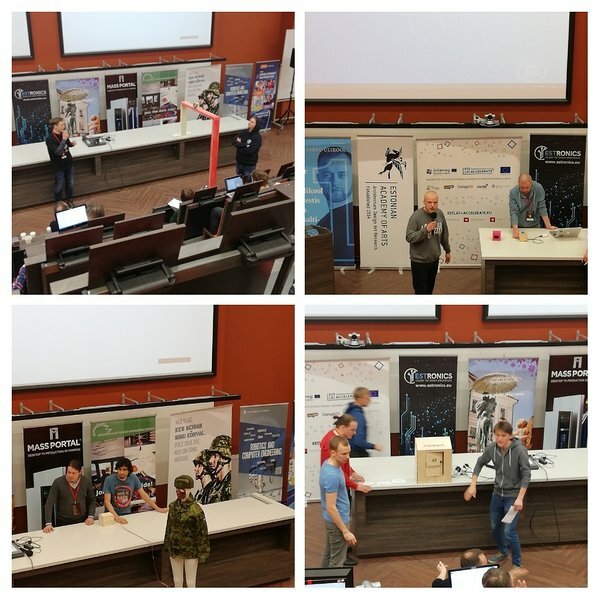 It's a kickoff to the Garage48 Hardware & Arts 2018! This year is a special year as we are celebrating our 5th Hardware & Arts! Welcome to everybody and enjoy the weekend! The Latvians have arrived! Now we have all the Baltic states under one roof! Time to create some magic! The first bus is here! Our participants from Tallinn have arrived. Welcome to the Physicum and make yourself at home, you will be living here for the next few days! 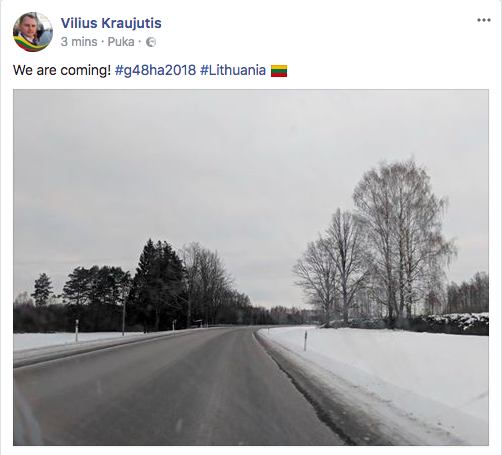 The Lithuanians are on their way! 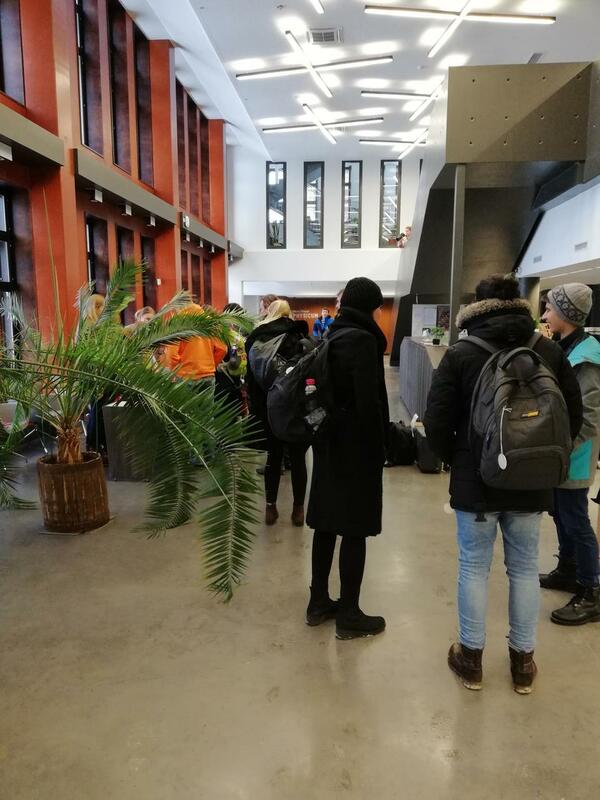 Some brave Lithuanians have already found their way into Estonia and it won't be long until they reach the Physicum! We are getting ready! 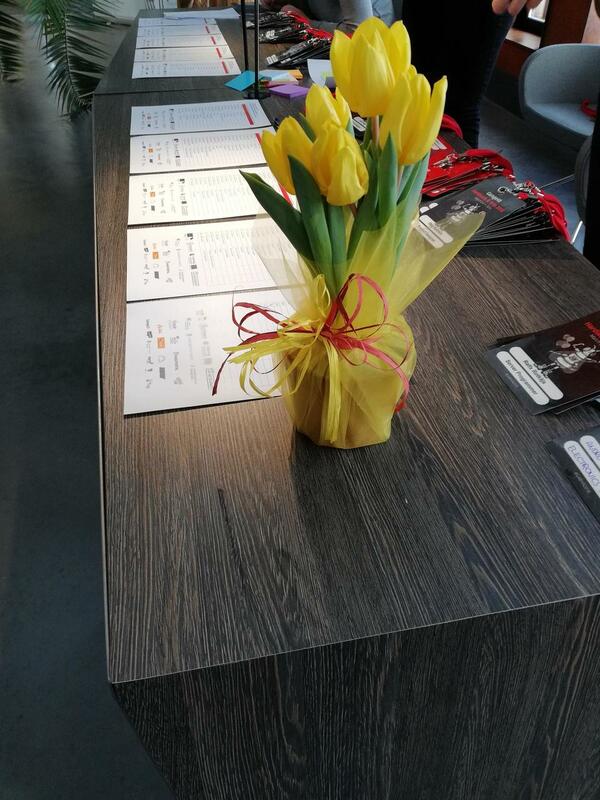 Welcome to celebration of 5 years of Garage48 Hardware & Arts hackathons! See you at 17.30 at Physicum, when doors open!